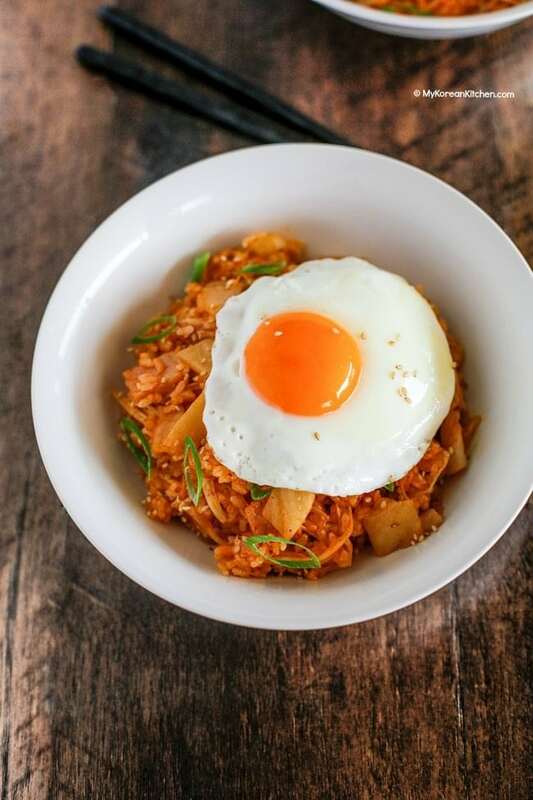 Easy kimchi fried rice recipe! 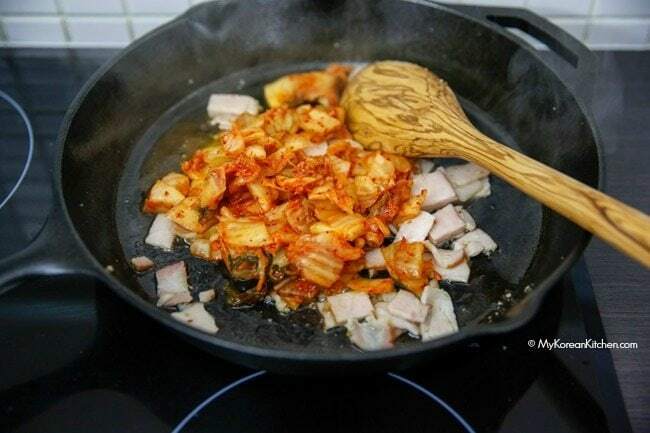 Kimchi and rice is stir fried with smoky bacon and spicy kimchi juice. It’s simply delicious! 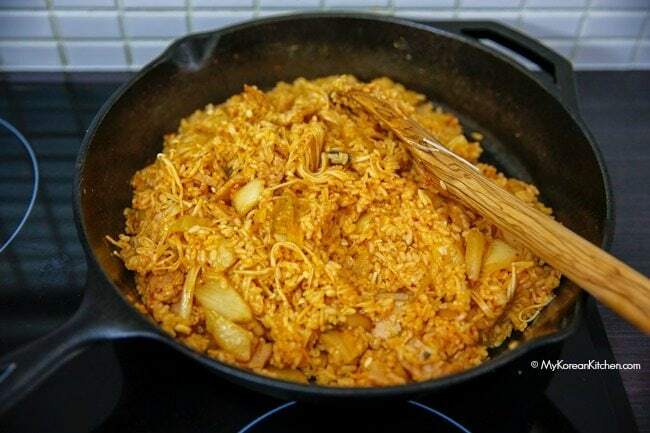 Kimchi fried rice (Kimchi Bokkeumbap, 김치 볶음밥) is a type of Korean fried rice and it is predominantly cooked with kimchi (obviously!) To give it more texture and flavor a variety of meat and/or vegetables are often added. 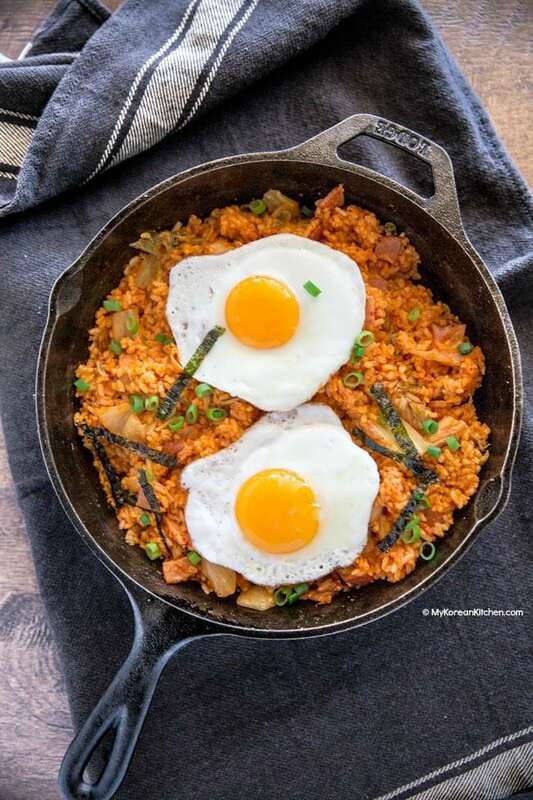 Kimchi fried rice is one of the most popular ways to use up your old ripened kimchi along with Kimchi jjigae (Kimchi stew) and Kimchi Pancake. 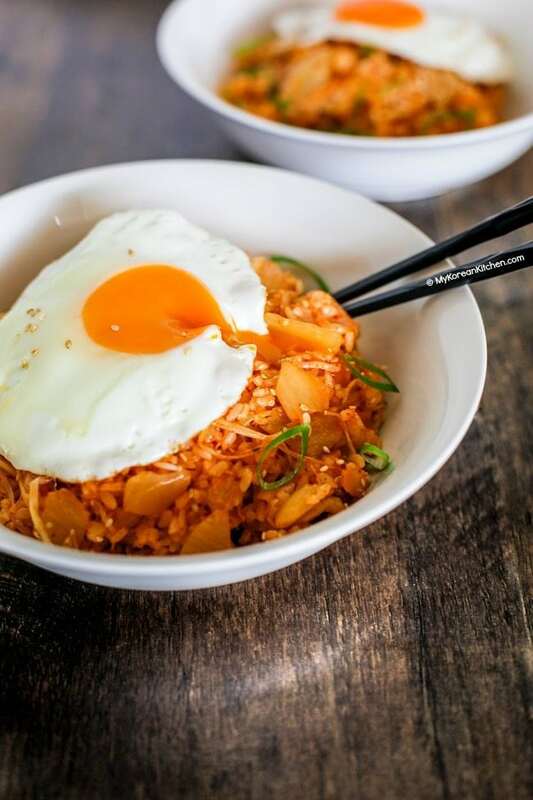 Kimchi fried rice is also a great way to use up some of your leftover steamed rice. You probably heard that one or two day old rice fries better? Let me put this into context. Typically, freshly steamed rice is moist and soft and when they get stir fried, they can go gluggy, which isn’t very nice in a stir fry dish! But, if you can manage the water amount well, you can use the freshly steamed rice as well. Just make the rice intentionally drier by adding slightly less water when you steam it. 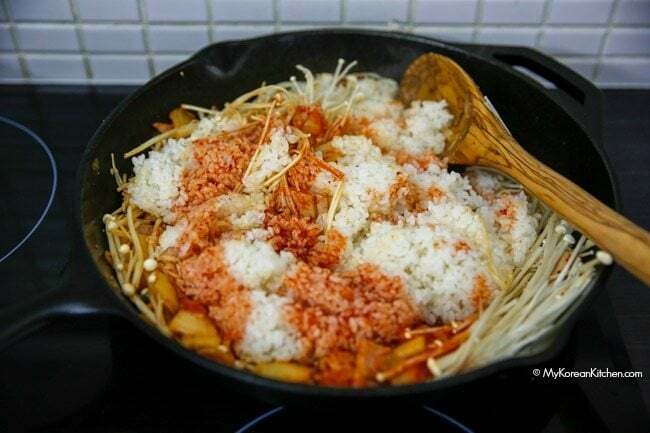 My last tip I want to share today is the best way to season the Kimchi fried rice. Which is using well fermented kimchi juice (from a kimchi container). I don’t normally add anything else – no gochujang (Korean chilli paste), no gochugaru (Korean chilli flakes) – unless I’m short of the kimchi juice! Of course, you can add either of them per your preference. And if you do, they will give you an extra spice kick for sure! Anyway, I hope you enjoy my recipe! P.S. If you like this recipe, you might also like my kimchi udon noodle recipe. Try it. It’s super addictive! 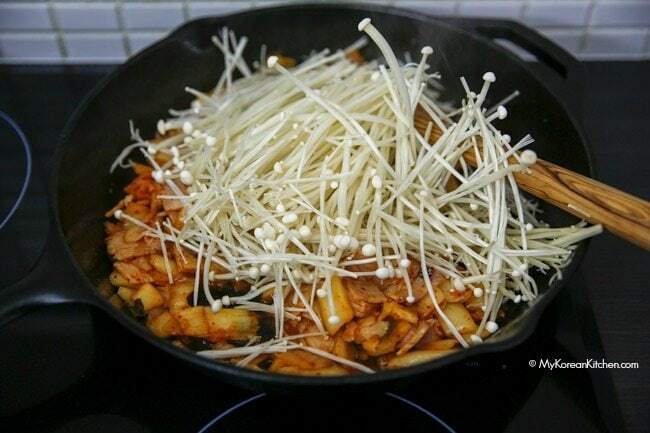 (optional) 1 pack enoki mushrooms (200g, 7 ounces), root removed, rinse the mushrooms in cold water and drain. 3 cups steamed white short/medium grain rice – if it is freshly cooked, leave it out for 5 to 10 mins at room temperature to cool down before cooking. Ideally the kimchi is at least 2 weeks old. If not, add 1/2 tsp rice vinegar into the kimchi juice to make it sour. Obtaining 1/4 cup of kimchi juice can be difficult if your kimchi is fairly new. In that case, use 2 1/2 Tbsp kimchi juice and 1 Tbsp gochujang instead. If you want it to be not spicy, you can add 1 Tbsp soy sauce instead of gochujang. If you want to learn more about Korean ingredients, check my 30 essential Korean cooking ingredients list! 1. 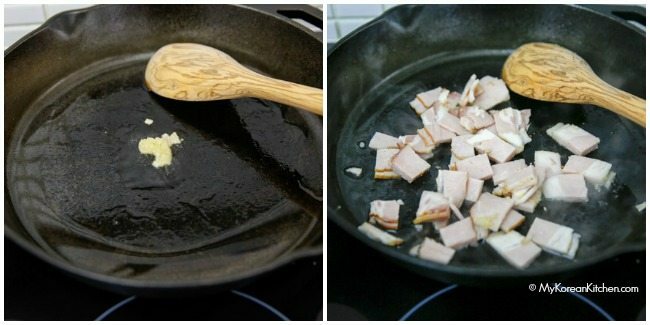 On medium high heat preheat a pan/wok and once heated, add the cooking oil and spread it well with a spatula. 2. Add the garlic, stir it fast for about 10 seconds. Then add the bacon and stir it well until half of it is cooked. 3. Add the Kimchi and stir until 80% of it is cooked. 4. (Optional) Add the mushrooms and mix them well for a few seconds. Reduce the heat to medium-medium low. 5. Add the rice and the kimchi juice. Mix all of them together well and thoroughly. 6. Add the sesame oil and mix them well. Remove from the heat. 7. Serve the Kimchi fried rice on a plate. Garnish with the sesame seeds, green onion and seaweed strips. (Garnish is all optional). Place the cooked egg on top. Enjoy! 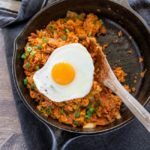 Quick and easy Korean kimchi fried rice! On medium high heat preheat a pan/wok and once heated, add the cooking oil and spread it well with a spatula. Add the garlic, stir it fast for about 10 seconds. Then add the bacon and stir it well until half of it is cooked. Add the Kimchi and stir until 80% of it is cooked. (Optional) Add the mushrooms and mix them well for a few seconds. Reduce the heat to medium-medium low. Add the rice and the kimchi juice. Mix all of them together well and thoroughly. Add the sesame oil and mix them well. Remove from the heat. 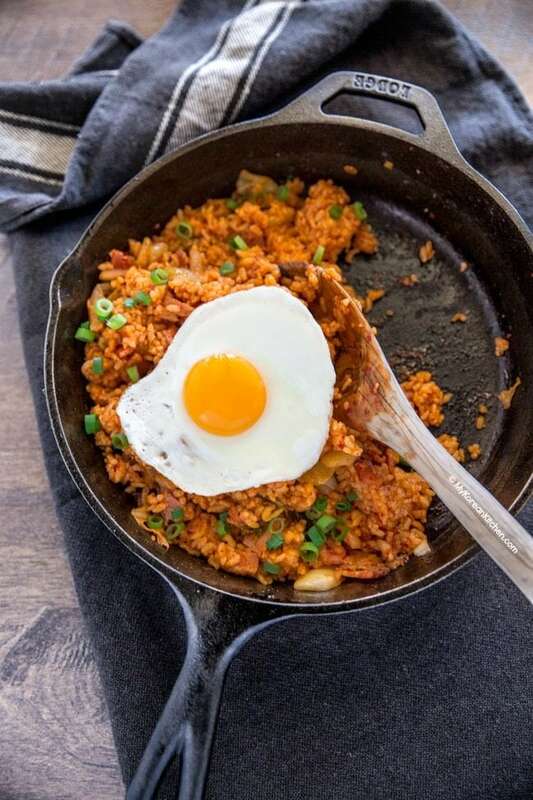 Serve the Kimchi fried rice on a plate. Garnish with the sesame seeds, green onion and seaweed strips. (Garnish is all optional). Place the cooked egg on top. Enjoy! Ideally kimchi is at least 2 weeks old. If not, add 1/2 tsp rice vinegar into the kimchi juice to make it sour. While I don’t enjoy cooking, I couldn’t resist making this just now. It was DELICIOUS! I omitted the bacon (time constraints) and overcooked the egg a bit (darn) but it was still very tasty. Even my husband tried 2 bites and he has no interest in new or Korean foods. Thanks for posting a great recipe 😊 I’m not on Instagram otherwise I’d post a photo. Perhaps Twitter? How much gochugaru or gochujang do I add? And also does it make the kimchi fried rice spicy? I don’t add any gochugaru, but I sometimes add gochujang. I normally add 1 Tbsp of it, but this can be totally adjusted based on your spice level preference. Yes, if you add gochugaru or gochujang, it will make the fried rice spicer. Also, please read my recipe notes above. I made a note about gochujang. Hope this helps! I loved this!! It was my first time making a Korean dish. I had to make a small change, to the mushrooms, couldn’t find the enoki anywhere. :'( troubles of a small town. But the shiitake mushrooms where still good. Currently making the slow cooker stew with pork! can not wait to try it. I am eager to make this soon. The look is irresistible. 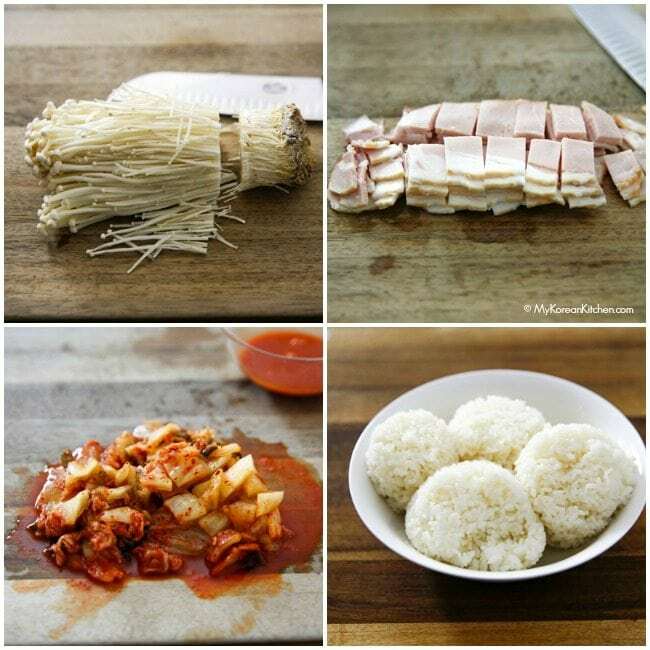 How do I mix the kimchi juice with the rice without it getting mushy? Every time I make rice with anything it turns mushy. Kimchi juice shouldn’t make the rice mushy, unless your steamed rice is already mushy and soft. (One of reasons why some people only cook with a day old rice. 🙂 ) What types of rice do you use for stir frying? Thank you for this recipe! IT IS SO GOOD! Sorry I’m yelling, but it’s very exciting:) It’s really hard for us to eat Korean at restaurants because we are gluten and soy free, so I have to alter things at home. Kiss, kiss! Even though I am a part Korean male and have made fried rice all of my adult life, I’ve never used kimchi in the recipe. My seasoning is more like Chinese, using soy sauce and oyster sauce as well as fresh ground black pepper. Being from Hawaii, chopped spam was the meat of choice although bacon was used from time to time. If I wanted the spicy fried rice, I added gochugaru near the end of cooking, never Tabasco or hot sauce. I bought your Banchan Cookbook online and have made quite a few side dishes. Along with your recipes and those of other Korean bloggers, I try to learn one or two Korean dishes a week. I have started a personal cookbook of Korean recipes, with photos and I try to include at least three banchan dishes with each meal. My family loves the Korean potato salad which is not too different from what we grew up with. Am loving the recipes. Reminds me of a wonderful holiday to Sth Korea last year. I am addicted to Kimchi !! I love this recipe, I’ve modified it for my diet. No Mushrooms, and tofu instead of bacon. YUM!! Thanks for all your amazing recipes..
Hi Michelle, That’s wonderful to hear! 🙂 Never tried tofu with this recipe, but I should give it a go next time. Can I use a different kind of mushroom? Would you recommend using overnight rice for this, for better texture? Thanks! Hi! If I wanted to make a spicy version of this, di I add gochugaru? And at which point do I add it in? Thanks! All your recipes look delicious! I would add a little bit of gochugaru or gochujang when I stir fry Kimchi. 🙂 Enjoy!